Roughly chop red onion. For the dressing, purée olive oil, red wine vinegar, garlic, habanero salt, chopped onion, and basil in a blender until smooth. If desired, season to taste with salt. Slice tomatoes. 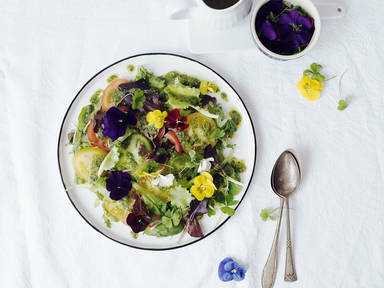 Spread the lettuce greens and tomatoes on a plate, sprinkle with the basil vinaigrette and flower petals. Serve immediately. Enjoy!